In Callistus site of Olympia, where they mingle with calm Alpheus and Kladeos River, the matrix of history gave birth to human ideals of peace, sportsmanship. Here, where athletes competed for prize with an olive branch and cities – states were making war truce from 776 BC emerged the world “… the beautiful, the great, the true.”. Olympia is a milestone and a starting point for all mankind through the ages. Today is the hunger of the people grow big and equipment Member growing up, the spirit of Olympism can again become the foundation stone for a human society. It is an area of ​​outstanding natural beauty with flowing waters, abundant vegetation and of course there in our mythology Zeus defeated the war of his father, Cronus, for their dominance in the secular world where he managed to beat him over the hill. The Olympic Games were held as today every four years with a prize of a wreath of wild olive wreath was called. The races were held after the summer solstice ie the months of July – August, the first full moon. At first they became in one day because it was only six sports later when sports got 18 days to conduct increased. The games were athletic, equestrian and later musicians. The announcement of racing from town to town was by spondoforous holding branches of olive and carried the message of the sacred truce which lasted for three months prohibiting any kind of warfare and capital punishment. All free Greek male citizens were entitled to participate in the games, but they should have committed sacrilege or murder. Slaves and barbarians were not allowed to participate, so that later the Romans tried to prove their Greek origin in order to take part. For women the rules were very strict, right to participate only had the owners of the horses in the equestrian events for the rest of the law was so strict that if you violate the punishment was death, the precipitated Mount Typaio. The only woman who violated the law and was punished Kallipateira, daughter of Olympian Diagoras the Rhodian, wife and mother of Olympic medalist Peisirrodou. Kallipateira wanted to attend matches her son and disguised himself as trainer to work it out but the excitement of the mother for her child betrayed ultimately reason of its origins, the death penalty is not imposed by the judges. Viewers who watched the fights were many and from all over Greece. The athletes had for a month to train in Ilia under the supervision of local judges. To comply with the regulations, organizing, conducting sports and the awarding of prizes were responsible Jurors, an institution that was originally hereditary and lifelong, later was by lot among the inhabitants of Elis. The 393 mCh by order of the Byzantine emperor Theodosius the games stopped and forgotten. In 1829, after the liberation of Greece from the Turks began excavations by French archaeologists stopped, however, when they transferred their findings to the Louvre. The 1875 Excavations resumed in bringing to light important findings. In 1894 the Frenchman Baron Pierre de Coubertin who was general secretary of clubs in France and believed that youth around the world has to play sports and not take part in wars. The ideas of those announced at a conference held at the University of Sorbonne and the last day of the conference the decision was the need to revive the Olympic Games. In 1896 in Athens organized the first modern Olympic Games IOC president Dimitris Vikela and secretary Pierre de Coubertin. The number of athletes who took part in the games did not exceed 250 but for its time was the largest sports event also highly influential in the world. Today the situation has somewhat improved the flame lit in ancient Olympia each time before the Games begin winter or summer and convey the message of the Olympic truce worldwide. At the Olympic Games in Athens in 2004 the sport of shot put was the archaeological site with great excitement from spectators and athletes as the ancient stadium opened its gates after centuries to accommodate modern games. The museum of modern Olympic Games is located in ancient Olympia is unique in the world and is home to memorabilia from modern games. In the western Peloponnese, in the beautiful valley of the river Alpheus, flourished the most celebrated sanctuary of ancient Greece, which was dedicated to the father of the gods, Zeus. Sprawls over the southwest foot of lush Kronios, between the rivers Alpheus and pruning, which bind to this region. Although secluded near the west coast of the Peloponnese, Olympia became the nationwide as the most important religious and athletic center. Here were born the biggest race of ancient Greece, the Olympics, which was held every four years in honor of Zeus, an institution with nationwide radiation and glare from antiquity to today. The beginning of worship and mythical confrontations that took place in Olympia lost in the mists of time. Local myths about the ruler of the region, the famous Pelops, and the river god Alpheus, reveal the strong ties between the sanctuary and both the East and the West. Around 10th-9th century. FrX. began to form the Altis, the sacred grove was planted with olive trees, pine trees, poplars and oaks. Then introduced the worship of Zeus and Olympia from Zeus was worship. For some time in the temple had no other structures except the Altis, which was protected by an enclosure, in which altars for sacrifices to the gods and the tumulus of Pelops. The numerous votive offerings, mostly figurines, bronze cauldrons and tripods were placed outdoors, on trees and altars. In the Geometric period date and the first figurines representing Jupiter, the main sanctuary. The 776 amCh reorganized in honor of the matches in Ifitos, king of Elis, from Kleosthenes of Pisa and Lycurgus of Sparta, who established and sacred truce. The Olympia held every four years and soon acquired a national character. 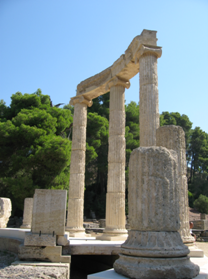 In the Archaic era began the great development of the sanctuary, as shown by the thousands of tributes period, weapons, statuettes, boilers and more, and then built the first monumental buildings: the temple of Hera, the Prytaneion the parliament, the treasures and first stage. The edge of the sanctuary continued in the classic era when it was built the magnificent temple of Zeus (470-456 amCh), baths, porticoes, treasuries, ancillary buildings, stage, moved to the east of the two ancient, except the sacred Altis. Numerous were the specials offered by the faithful. The countless statues and other valuable works that existed across the sacred precinct of the Altis lost, since the sanctuary was looted several times in antiquity, especially in the Roman era. During the Hellenistic period the construction of buildings mainly secular, like the gymnasium and the palaestra, and in Roman times were alterations to existing buildings. Also, they built baths, luxury homes and aqueduct. The sanctuary was plundered, so that excellent tributes to decorate Roman villas. The operation continued normally early Christian times Constantine the Great. The 393 mCh were the last Olympics and later the Byzantine emperor Theodosius, he decreed permanently banned the marriage, while Theodosius II, came the final destruction of the temple (426 mCh). In the middle of the 5th century. mC. up to the already dilapidated buildings developed small Christian settlement and workshop of Phidias became a Christian basilica. Two large earthquakes in 522 and 551 metersCh caused the final destruction of the sanctuary, as long as you then collapsed buildings were left standing, among them the temple of Zeus. In the following centuries the area was covered by the flooding of the rivers Alpheus and pruning and by landslides of Kronios and Olympia passed into oblivion with the ruins covered with backfill 07.05 measures. The area was called Echoes and only 1766 showed the site of the ancient sanctuary. The first excavations conducted in 1829 by the French Scientific Mission to the Peloponnese, led by quarterback NJ Maison. Then revealed part of the temple of Zeus and parts of the metopes decorated, many of which were transferred to the Louvre Museum. The systematic investigation of the sanctuary began in 1875 of the German Archaeological Institute and continues today. The most recent research in the last decade were in the southwest building, under the direction of Professor of Classical Archaeology at the University of Wurzburg and member of the German Archaeological Institute, Mr. U. Sinn, and prehistoric buildings of the sanctuary, under the direction of Dr. H. Kyrieleis, T. Director of the German Archaeological Institute. Today, alongside the excavation work, take place conservation and restoration projects throughout the site of the ancient sacred site.